Say goodbye to that obnoxious alarm clock, scaring you out of bed every morning with its cacophonous din. Now you can rage against the dying of the light with the Glo Pillow, gently waking you up with soft LED lights, slowly increasing their brightness over 40 minutes just like the sunrise. Also embedded under a few layers of cushiony foam is a digital display, perfect for those who sleep with their heads completely buried face down into the pillow. Even though this tech seems far-fetched, the pillow's display and lighting are designed around an LED woven substrate that's been actually demonstrated by Philips. 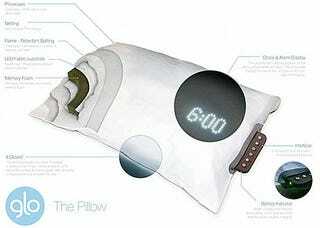 But the Glo Pillow is just a design concept so far, and a few problems have yet to be worked out, such as, would a serious bout of night sweats turn into a shocking experience? It also might be a bit daunting to spend, say, $1000 on a pillow just so you can go gentle into that good night, but nobody's talking price just yet.